Addiction causes one in four deaths in the US and affects everyone in one way or another. * Anusara yoga aligns beautifully with treatment techniques that work to gain and maintain a sober way of life. Interested in learning how to better help those suffering from an addictive disorder find a sense of Self-Empowerment and healing? Discover how to teach embodied heart language and life-affirming philosophy as a powerful tool for those affected by addictive behaviors. Learn how to help your students feel better in their bodies, calm their obsessive minds and deepen their connection with their Higher Power. A familiarity with the Universal Principles of Alignment and Anusara Yoga Philosophy are helpful but not required. This course is eligible for 12 elective hours toward ASHY 300 hour Teacher Training and Yoga Alliance CEU's. Certificates will be given after complete attendance. 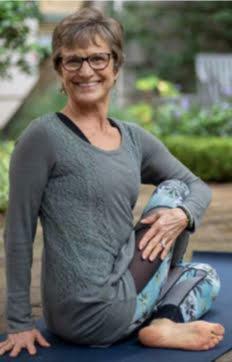 Certified Anusara Yoga Teacher Gail Corvette. Sober since 1995, she credits her Anusara Yoga Teacher training (ten years into her recovery) for finally accepting her disease and feeling whole. She has two certifications for teaching the recovery population: S.O.A.R. (Success Over Addiction and Relapse) geared toward teaching recovering addicts in treatment centers and Y12SR (Yoga of 12-Step Recovery) focused on a public 12-step meeting and themed practice. She is Anusara’s Subject Matter Expert on Addiction Recovery and presented on this topic at Samavesha in 2016. She has taught yoga to the recovery population since 2011: in a private home to members of Alcoholics Anonymous, to inpatients and outpatients at the County-run drug and alcohol rehab center, on retreats, at Conventions, for fundraisers, and in a weekly Y12SR meeting at the County rehab center for the patients, members of “A” groups and the recovery community.